American Eagle Outfitters is a brand that specializes in producing state of the art fashion clothing and accessories tailored to the tastes of the youth of the day. This can be seen to its best in the collection of American Eagle Jackets. This is a unique jacket from American Eagle that is athletic on one end and a classic 80s throwback on the other. In its essence it is a true American Eagle product. Made using soft cotton blend the jacket features a ribbed pop collar nicely complimented by retro athletic piping. You will find two large pockets in the front with a full zip construction. The vintage fit jacket is decorated with signature American Eagle embroidery. Ribbed cuffs with hemming and a reinforced interior neck tape further add value to the product. The material for the jacket is 60% cotton and 40% polyester. You can get your hands on this old school American Eagle jacket for $39.95 only. This big time jacket is sure to keep the ladies warm in the severest of winters. This is a fun filled fur lined jacket from American Eagle. The jacket is constructed with a wool blend twill body and has a faux fur lined hoodie to add to its glory. A quilted interior lining makes for comfortable wear and provides plenty of warmth. The front of the jacket features a brass zipper with snap up storm placket. The ribbed waist and cuffs help to seal the warmth. The jacket also has side pockets with signature button details. You can get your hands on this bomber jacket for $99.50. Men can literally take on the Alpines with this true heavyweight jacket on. The rugged cotton blend body with the fully sherpa lined faux hood trim gives the wearer utmost comfort and warmth in style. A heavy duty zipper with button close storm placket makes sure Mother Nature is kept under control. Reinforced seam stitching adds further strength to the jacket. Genuine leather trim details can be seen on the zipper arm pockets. Rest assured no animals were harmed in making this bomber jacket as the fur you see is faux. Feel the warmth of this rugged American Jacket that will keep you ever ready for action in the winters. The jacket is made using washed cotton canvas and as the name suggests it is fully lined in warm sherpa. The jacket features a slit chest with a side pocket and leather trims. You also have a hidden interior pocket in the jacket. The antiqued metal zipper adds style whereas the snap close storm placket helps you to stay warm. Under the left pocket you will be able to find signature eagle embroidery that stamps the jacket with the trademark of the brand. 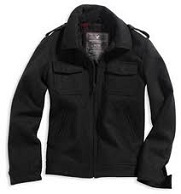 The jacket is machine washable and is excellent for areas that receive severe winters.